"Some things never change. Love, respect, human decency doesn't change. Your mother and I have these things." 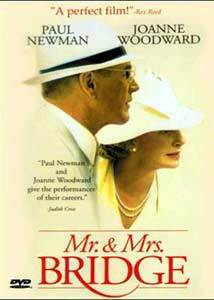 Mr. & Mrs. Bridge stars real-life husband-and-wife team Paul Newman and Joanne Woodward as a moderately affluent Kansas City couple, raising their three children during the social transitions of the late 1930s and early 1940s. Daughter Ruth (Kyra Sedgwick) moves to New York in pursuit of an acting career, younger daughter Carolyn (Margaret Welsh) marries her college boyfriend, and son Douglas (Robert Sean Leonard) joins the Army, while lawyer/father Walter (Newman) and homemaker/mother India (Woodward) do their best to pass their values on to the next generation. This 1990 production was another in the long line of cerebral, dignified films produced by Ismail Merchant and directed by James Ivory, with a script by frequent Merchant-Ivory collaborator Ruth Prawer Jhabvala. Unfortunately, this one misses the mark from an emotional standpoint. While the movie is blessed with consistently fine performances (another great job by Paul Newman, whose work seems to improve with each new performance) and exquisitely detailed period sets, props and costumes, the story's events are strangely distant and uninvolving. Blythe Danner's turn as India's mentally-ill friend Grace manages to generate some genuine feeling, but the subplot gets lost in what is otherwise a sterile, cold movie. This appears to be a story about changing times and values, but none of the characters undergo any significant evolution, and there's precious little illumination of the human condition. Walter's conservative beliefs hold obstinately fast in the face of significant sexual and racial change, while India's befuddled reactions to the world around her seem limited to laughter and tears; Walter has little emotional connection with his family, while India seems to have no will of her own. Perhaps the creators' point is that the Bridges survive by clinging to their beliefs and behaviors, but they come across as small-minded people who alienate their children more with each passing year and have no real friends, not even each other. The world inflicts no great comedy or tragedy on the Bridges, just inevitable change amidst routine, thoroughly average existence. While the technical execution has some merit, we get the gist after the first hour or so, and an awkward text epilogue seems to contain more substance than the preceding two hours of footage. A rare failure from the producing/directing/writing team that brought us Remains of the Day. Image Transfer Review: HBO presents Mr. & Mrs. Bridge in its original 1.85:1 widescreen theatrical aspect ratio, with a nonanamorphic letterboxed transfer. The source print has a surprising amount of damage for a 1990 release, with several large, dark blotches that crop up at the most distracting times. The transfer is a bit soft, but color and black level are good and detail is acceptable (though the lack of 16:9 enhancement leads to excessive scanline shimmer in a few scenes). Not a reference-quality transfer by any means, with a two-hour-plus film crammed onto a single layer, but certainly watchable. Audio Transfer Review: Mr. & Mrs. Bridge features a Dolby Digital 2.0 surround audio track, taken from the theatrical Dolby Stereo soundtrack. The mix is generally monophonic in character, with only one significant usage of the rear surrounds and just a few instances of stereo separation in the front. Dynamic range is good, with competent frequency range devoted to Richard Robbins' inappropriately ominous score, but this is a simple, dialogue-dominated soundtrack translated successfully if unspectacularly to the digital domain. Extras Review: The Mr. & Mrs. Bridge DVD features 19 picture-menu chapter stops, subtitles in three languages, and cast and crew biographies and selected filmographies for seven cast members, director James Ivory and screenwriter Ruth Prawer Jhabvala. The subtitles overlap the nonanamorphic "black bars" significantly, an unfortunate flaw for viewers with 16x9 sets, and the subtitle channels are not labeled with the traditional ENG, FRA, or ESP labels, making it impossible for "subtitle seek" player features to function properly. There are no substantial supplements on the disc. Mr. & Mrs. Bridge is a nuanced slice-of-life family drama that ultimately evokes little emotion. HBO's DVD transfer is non-anamorphic but reasonably solid, though extras are very limited. Still worth a rental, but the Merchant-Ivory team has done much better work.